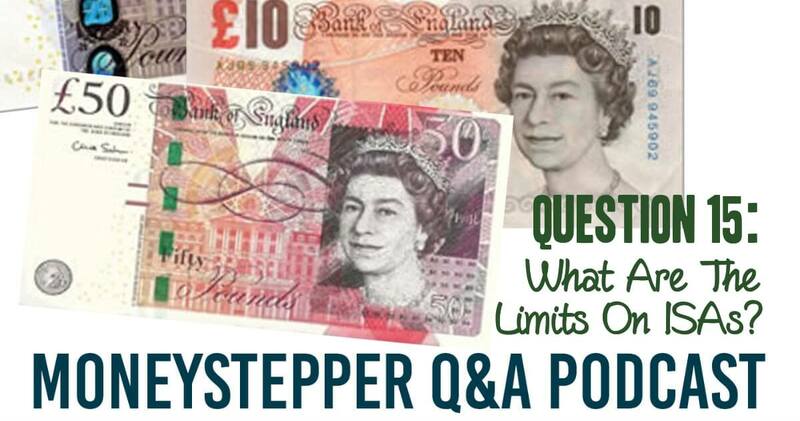 Question 15 - What Are The Limits On ISAs? I’ve started saving in a cash ISA, and I understand that there are certain limits on ISAs to how much I can earn. Could you please explain the how the limits on ISAs work? What Are The Basic Limits On ISAs? Nice, short sharp question Michael, thank you. The answer will be much shorter and sharper following the last budget, where the limits on cash ISAs and stocks and shares ISA were greatly simplified. I won’t go into what they used to be, as it’s no longer relevant and was laboriously complicated. Now, the limits (for the tax year running until April 2016) on either cash ISA or stocks and shares ISAs are that you can only invest a total of £15,240 into your ISA in the tax year. So, this is the total amount of money (cumulatively) that you deposit into the account. It is completely independent from what you have put in to them in prior years, and of any capital gains, interest or dividends that you may have earned. You can choose to invest in all in a cash ISA, all in a stocks & shares ISA, or split the allowance between the two in any proportion that you deem fit. However, like everything in this world, there are always some fiddly things that might catch you out that you should probably know as well. Firstly, it’s good to know that your allowance resets every year, and you cannot carry forward your unused allowance. So, whether I put £5,000 or £15,000 into my ISA in this tax year, my limit will not changes for next year. You have to be a UK resident aged 16 or over for the cash ISA, and aged 18 or over for the stocks & shares ISA. Money can be withdrawn at any time, but this is also not relevant for the limits. Limits are set on deposits only. So, say in May you deposit £10,000 into a cash ISA, but you withdraw it in October. Then, in December, you can still only deposit a maximum of £5,240 because you’ve already used up £10,000 of your deposits. You can transfer ISAs (both cash and stocks and shares) from one provider to another. However, you must always do this through the official channels. If you withdrew £30k that had built up in your ISA for example, you would only be able to put £15k of it into a new ISA. However, if you speak to your new provider, and fill in the forms, the full £30k can be transferred from one ISA to another. Finally, they are not available yet, but it’s worth knowing about the Help To Buy ISAs in advance of their release (expected in December 2015). You can only open a Help To Buy ISA (we’ll surely have a question on those soon, so I’ll wait until that comes before going into any detail) if you’ve not already opened a new ISA in the same tax year. Bizarrely, contributing to an existing ISA in a new tax year is considered as opening a new ISA. So, if you want to take advantage of the new Help To Buy ISAs this year, it may be worth holding off with your ISA investing this year (especially cash ISAs as these can be replaced by current accounts or savings account that have a post-tax interest rate which is as good as the cash ISAs anyway). I hope that answers your question Michael. Q&A 71 – Are ISAs or Pensions More Tax Efficient?